The dispute over whether Gov. 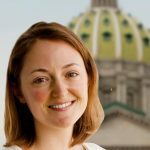 Tom Wolf is able to remove an appointed Office of Open Records director lands in Pennsylvania’s Commonwealth Court Wednesday morning. The state Senate GOP, who sued to have Erik Arneson restored as Office of Open Records director, says his removal violated the independence of the agency, which decides appealed record requests. The state attorney general’s office, arguing for the Wolf administration, says in its brief that the Legislature has no standing in the case, and likens the complaint to a “garden-variety ‘wrongful termination’ claim.” The brief states that the open records director, as an appointee, serves at the pleasure of the governor, especially since the Right-to-Know Law, which established the agency, is silent on how directors can be removed. Nearly two weeks ago, Wolf removed Arneson as OOR director, expressing disapproval that the appointment had been made in the last days of former Gov. Tom Corbett’s term. Since then, Arneson has been reporting to the OOR daily and checking in with staff, who he says respect a power-sharing agreement he has with the agency’s current acting director, Nathan Byerly. Arneson said he has used borrowed office space, mostly in Senate Republican quarters, to work on plans for the OOR’s website and testimony before state lawmakers during budget hearings.